Allen B. Carter defies categorization – except in one category. He was big. Standing six feet, four inches tall, Al had a big laugh, a big personality, a big imagination, a big heart and immense talent. 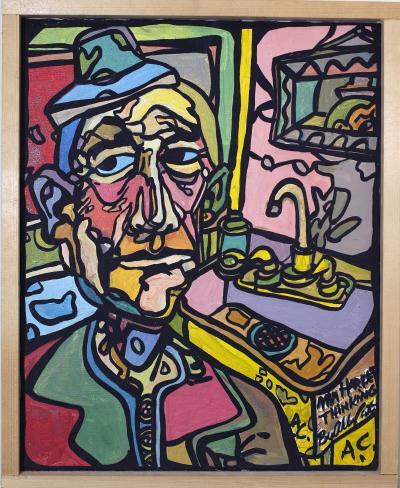 Al presented himself as an outsider to the fine arts world, someone who was just “trying stuff,” “messing around” and “having fun.” But Al was a classically trained artist who received great critical acclaim. This exhibition presents more than 80 paintings, sculptures, drawings and assemblages that reflect his expansive creative spirit. All works in this exhibition are on loan from Flora Stone and Cecilia Carter. This exhibtion is supported by the Herberger Institute for Design and the Arts and the Evelyn Smith Exhibition Fund. Big Al: Larger than Life was curated by Dana and Steven Tepper and was designed by Stephen Johnson, chief preparator.